There are few places I've been as to which opinions diverge as widely as Nihonryori RyuGin, the Tokyo restaurant of Chef Seiji Yamamoto. It holds three Michelin stars and, for whatever it's worth, has recently made a rapid climb up the S. Pellegrino "50 Best Restaurants" list. More important to me, several folks whose opinions I've come to trust had spoken of great meals there. And yet other reports – including more recent visits from some of those same people – ranged from indifferent to disappointed. I can't speak to anyone's experience but my own. 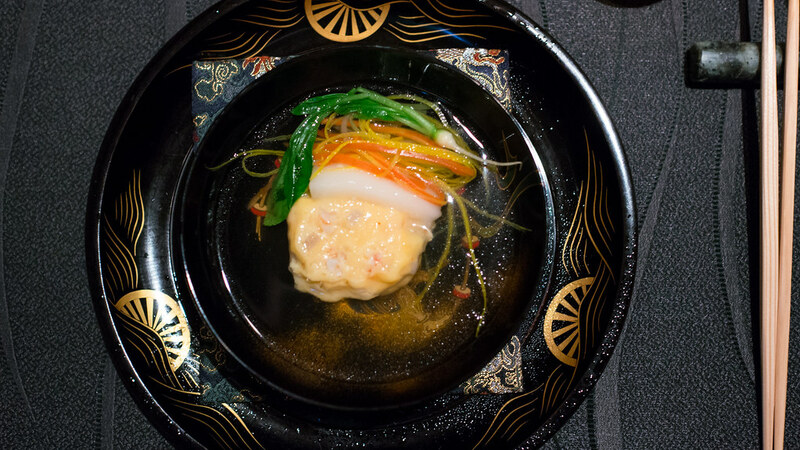 And even then, there are few culinary genres as to which I feel less qualified to opine than kaiseki, which lies at the foundation of RyuGin's style, and which for me was unexplored territory prior to this meal. So take it for whatever it's worth: I found RyuGin to be a beautiful, well-executed and fully realized dining experience. My admittedly naive understanding of kaiseki includes at least a few components: a strong focus on seasonality; a somewhat regimented procession of courses that feature a variety of cooking methods; and layers of symbolism – in the ingredients, the presentations, and even the plates themselves. As a meal that endeavors to tell a story of the season, this centuries-old tradition has uncanny similarities to what's lately been labeled the "New Nordic" school of cooking. Though RyuGin has a reputation as being in the thrall of the "modernists," its style seems to have become more, rather than less, traditional over the past few years. Chef Yamamoto is familiar with the latest techniques and gadgetry, but for the most part, they seemed to stay in the kitchen and were virtually invisible on the plate. 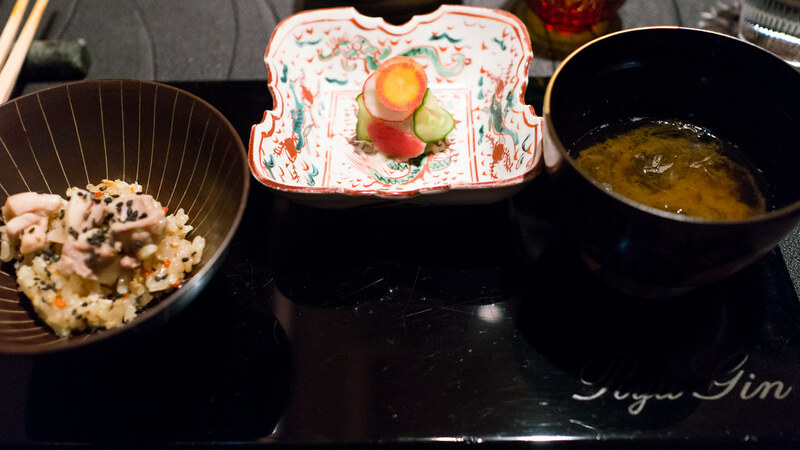 Rather, the meal unfolded as a meditation on Japanese ingredients, seasons, and flavors. (You can see all my pictures in this Nihonryori RyuGin flickr set). 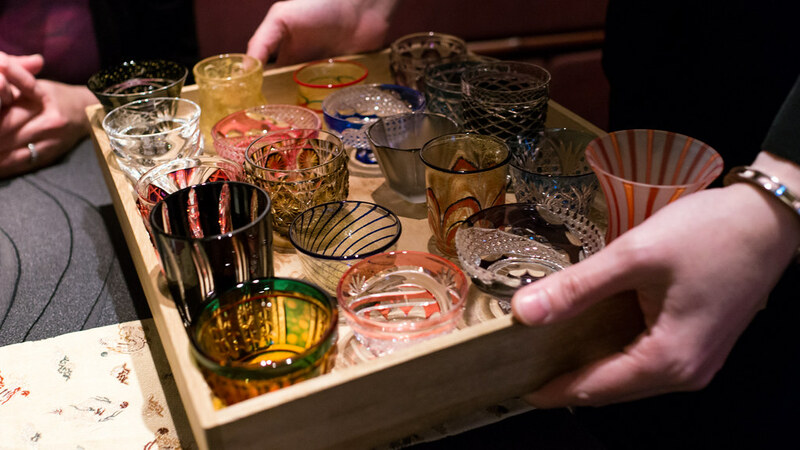 The attention to both elegance and craft is on display even before any food arrives, as the server offers a choice of beautiful Edo Kiriko sake cups for each diner to select. 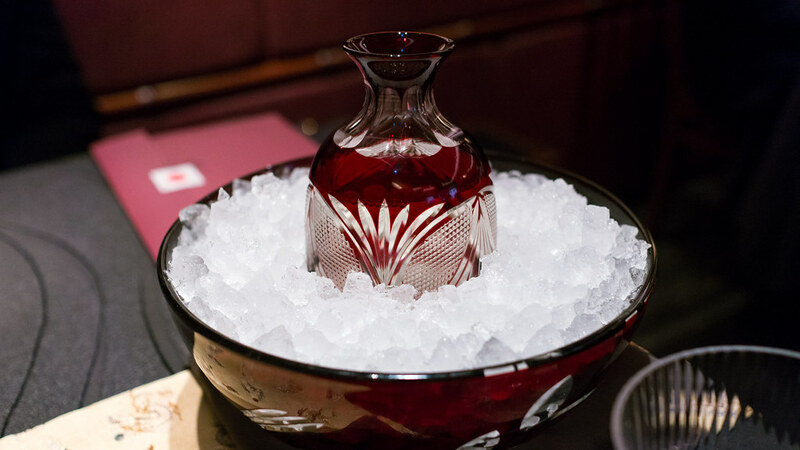 Sake is decanted into a cut crystal carafe, nestled in a matching bowl filled with crushed ice. 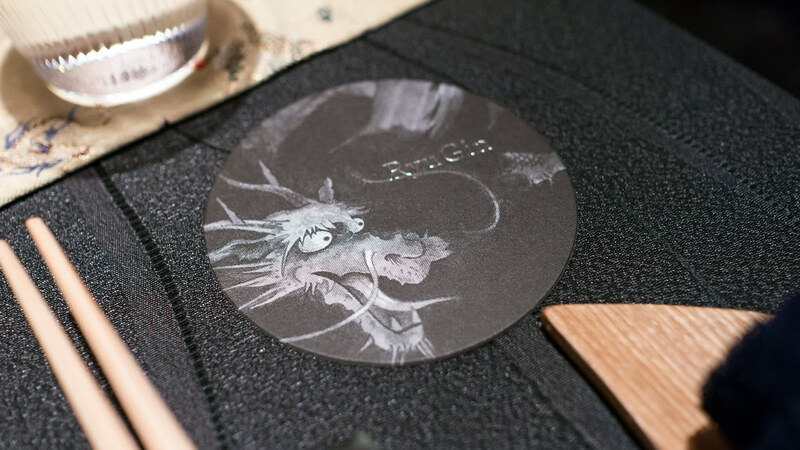 The coaster is emblazoned with a dragon, a motif that makes several appearances around the restaurant. The menu is wordy. 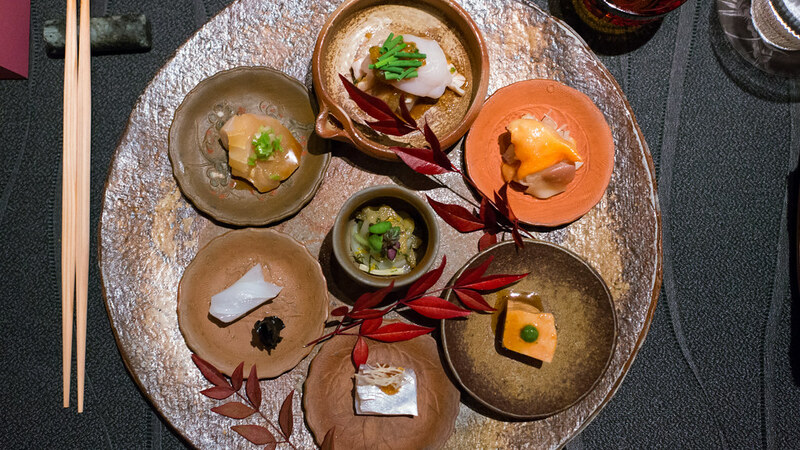 This is a dinner with a "title," "Plating the Prodigality of Japanese Nature," and this first course is described as "Beginning with a variety of Sensations ... Seasonality, Aroma, Temperature, Texture and Assemblage." But despite the verbosity, the dish is actually beautifully simple: a selection of seasonal vegetables, accompanied by a warm turnip soup garnished with a tongue of uni. It being February, the greenery consists mostly of tiny little buds and stems, what I believe the Japanese call "sansai" or "mountain vegetables," their compelling bitterness offset by a creamy pine nut dressing. Temperature and texture contrasts indeed are a recurring theme. 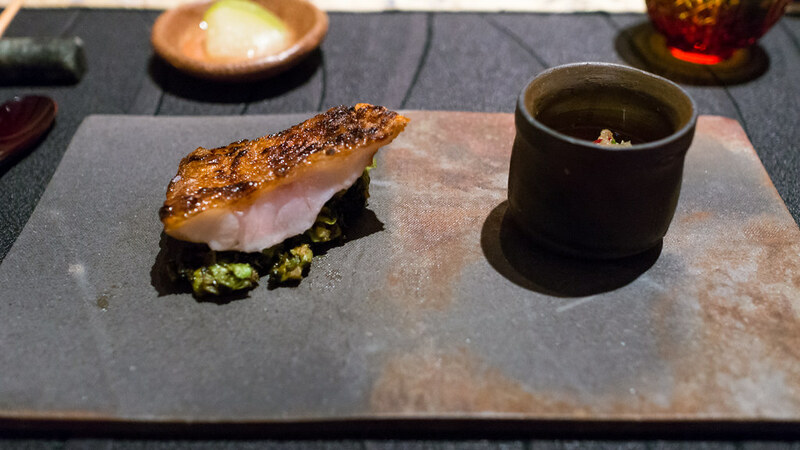 Here, two delicacies from the sea: seared cod milt, served warm, like creamy oceanic sweetbreads, with nothing but a wheel of sudachi to enhance the flavor; and abalone, simmered and served cool, the ribbon of muscle scored with diagonal cuts to further tenderize its resilient texture, plated with wakame seaweed and a dab of apple vinegar jelly. 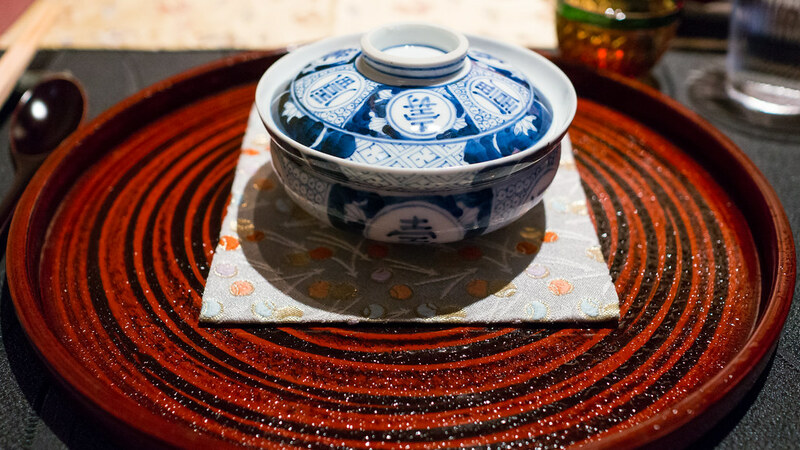 A lidded bowl on a matching platter adorned with sea and wind patterns revealed a limpid golden dashi broth, in which floated a delicate kuruma prawn dumpling, a chewy mochi rice cake, plus a tiny baby turnip and a fine julienne of other root vegetables. Another grandiose title – "Philosophy on the Ichiban Dashi - Taste of the Wind that Captures a Moment" – for another elegantly simple dish. The sashimi is a real highlight at RyuGin. Seven different items are arranged in a circle, each with a different garnish, each excellent. 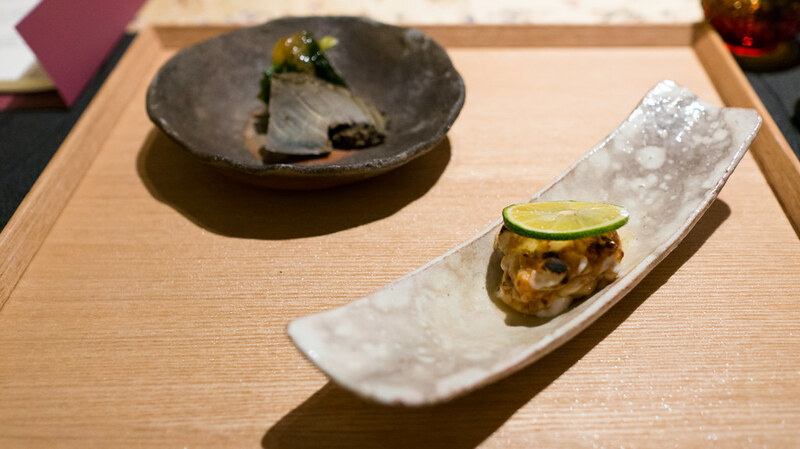 Working clockwise from the top: fugu (blowfish) flesh and ribbons of its skin in a ponzu sauce, garnished with snipped chives; akagai (ark shell clam) and hokkigai (surf clam); ankimo (monkfish liver) with a dab of kinome (prickly ash) purée; silver-skinned ibodai (butterfish) with slivered ginger; ika (squid) with salty seaweed; sawara (Spanish mackerel), smoked, topped with finely chopped green onion; and in the center, strips of squid in a sea cucumber sauce. The quality of the fish is outstanding, enhanced but not overshadowed by their accompaniments and treatments. As a grilled course, we were served kinki fish (a/k/a thornhead, thornyhead, rockfish or "idiot fish") over a rough mash of green (soy? fava?) beans, accompanied by a bowl of avocado with finely chopped marinated vegetables, and some pickled apple slices. To me, the condiments were sort of irrelevant, but the fish itself – the skin finely browned and crisp, the flesh silky, fatty and rich, bearing just a hint of grill smoke – was excellent. 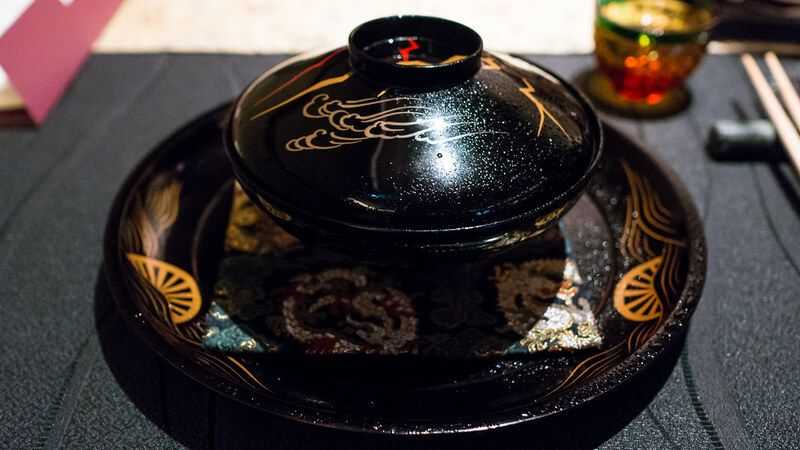 Another traditional part of a kaiseki procession – a simmered preparation – is presented in a beautiful blue and white dish. 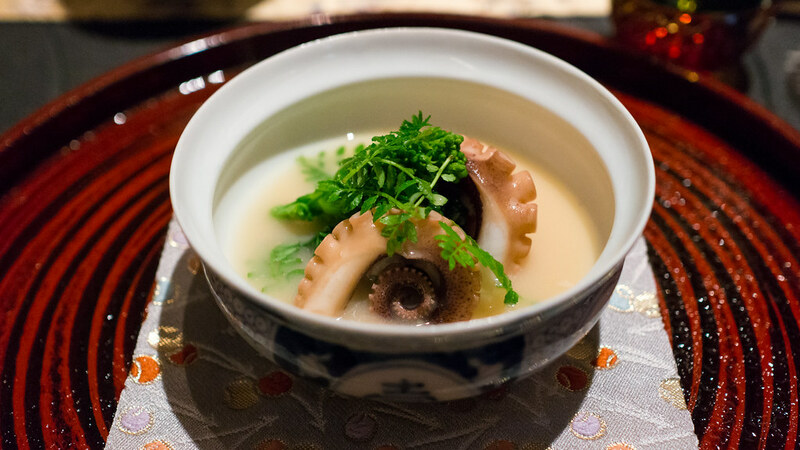 Under the lid, tender octopus tentacles are perfectly arranged as if for a demonstration of the "golden ratio," together with cloud-like cod roe and a garnish of tiny kinome leaves, all in a delicate white miso broth. 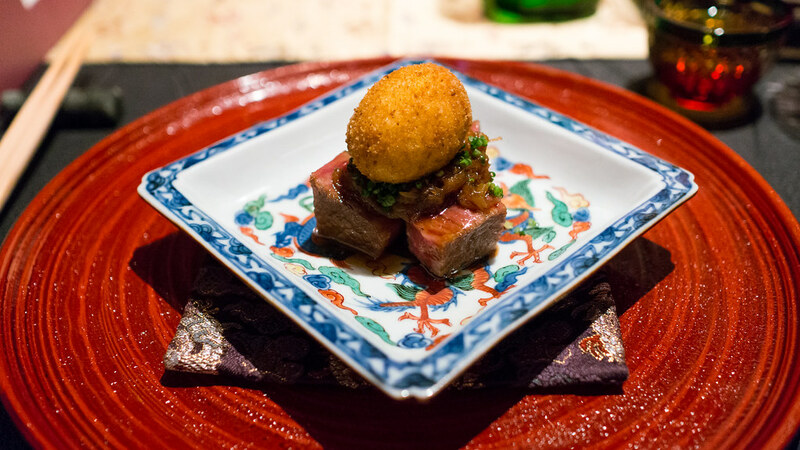 Japan's "wagyu" beef is nearly as famed as its seafood – and yet we realized at the end of our trip that this course represented pretty much the only beef we ate during two weeks in Japan. Charcoal grilled, and topped with sweet sauteed onions and a crispy poached egg, the accompaniments duplicate the flavors of traditional "sukiyaki." To follow, something resolutely traditional, even homey: fresh Niigata rice with chopped chicken and black sesame seeds; pickles of seven different vegetables, still very fresh and snappy; and a bowl of red miso soup. Described as "Pleasure of eating of the same trencher ... Memory of Chef Yamamoto's Childhood," it's an overtly nostalgic, sentimental dish. 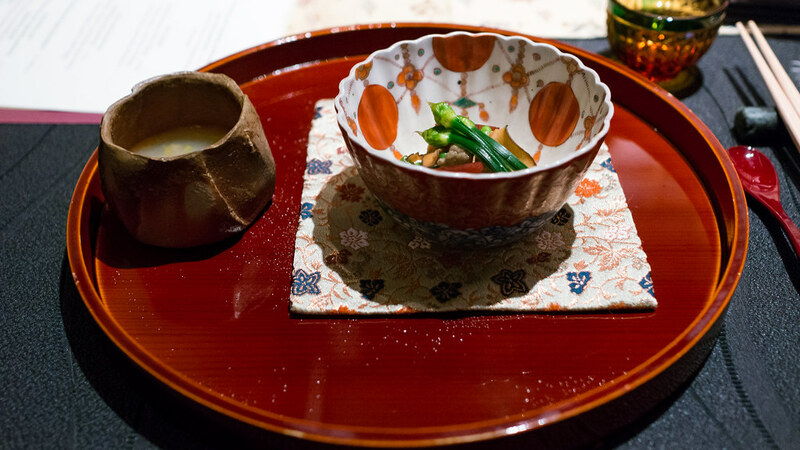 Though the combination of a rice dish, pickles and soup is the traditional closing savory course of a kaiseki meal, it's a bit of a surprise to find something as simple as "chicken rice" in this context. 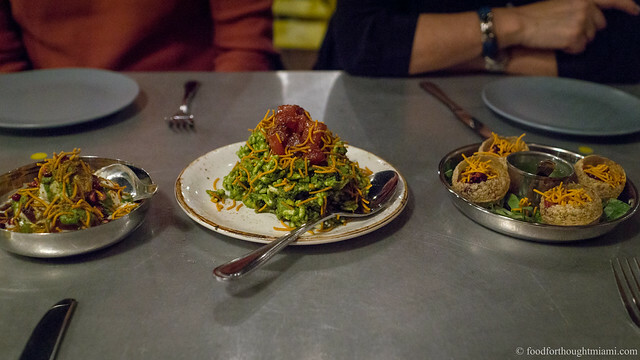 But this clearly aims for the feel of a "home-cooked" dish and hits its mark. 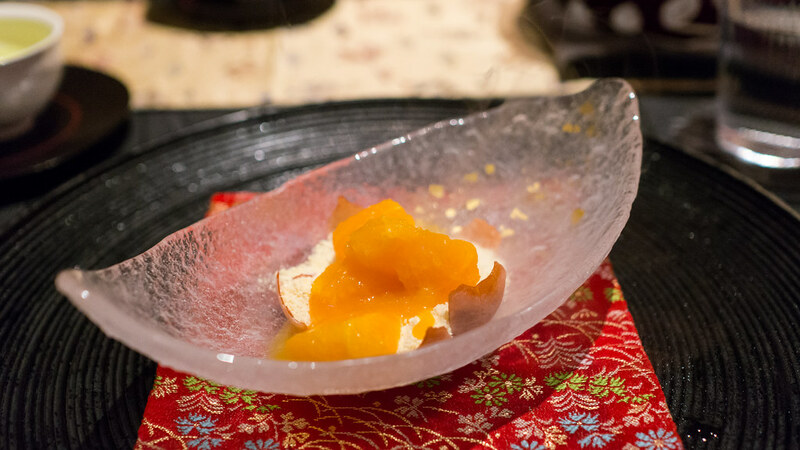 Dessert offers some modern culinary pyrotechnics: this "iced tangerine" has a delicate pulled sugar shell that shatters with the tap of a spoon, spilling out an interior of powdered frozen tangerine ice, over which the server spoons a dollop of warm tangerine jam. (You can see the technique applied to strawberries in this hypnotic video.) It's a great show. 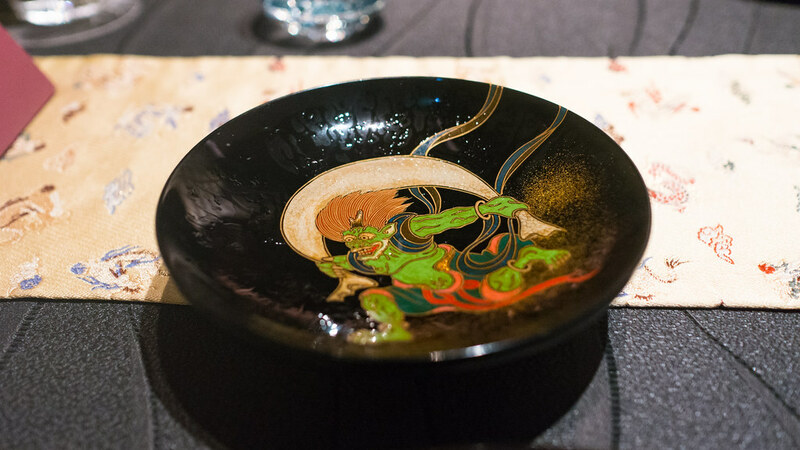 Even better – one of the best desserts I've had all year – was the "Hot Sake and Cold Sake." On one side, a perfect, puffy souffle; on the other, a creamy cold sake ice cream. 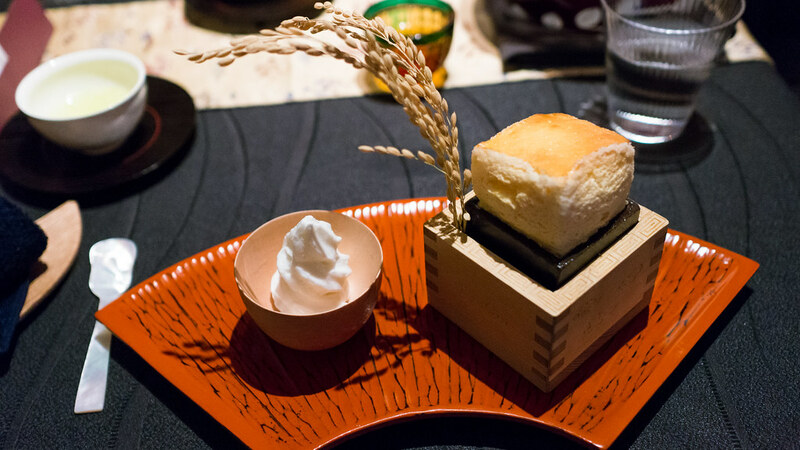 The sake which flavors the souffle is typically served warm, the one which flavors the ice cream typically served cold – and both preparations so clean and pure that the delicate sake flavors still emerge. 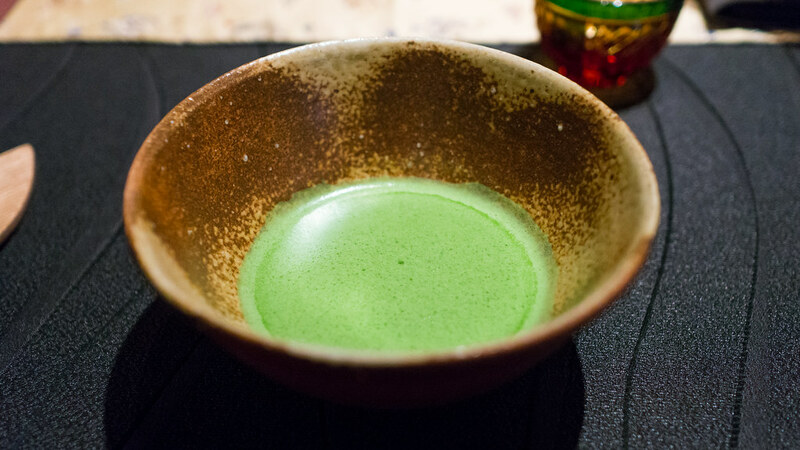 A cup of frothy, vibrant green, and bracingly bitter matcha tea concludes the dinner. 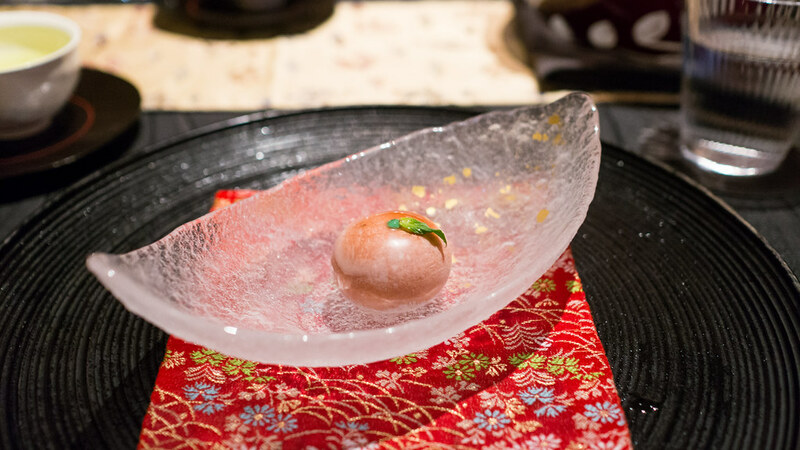 This was not necessarily a meal filled with "wow" moments – and some may reasonably expect that a dinner at this level (i.e., three Michelin stars, roughly $250 per person) provide such epiphanies. In some instances, like the chicken rice dish, the food was surprisingly prosaic, though clearly purposefully so. But as a complete experience – excellent ingredients, varied preparations, refined flavors, elegant presentations – I found it a rewarding and memorable meal. This may be in part because RyuGin's fan club includes several prominent Westerners: Ferran Adrià has sung its praises, as well as Heston Blumenthal, and years ago DocSconz noted that Chef Yamamoto and Antoni Aduriz of Mugaritz are good friends. Some prior reports: ChuckEats from 2009 and 2010; Andy Hayler (also 2009); Tomostyle from year-end 2013. What I know of kaiseki comes almost entirely from the gorgeous and informative book "Kaiseki: The Exquisite Cuisine of Kyoto's Kikunoi Restaurant " by Yohishiro Murata, chef of the Kyoto restaurant Kikunoi (a place we were going to visit before Mrs. F got "kaiseki'd out"). Mrs. F fell in love with these glasses, which we later discovered can cost several hundred dollars a piece. I've seen "RyuGin" translated as "dragon," "dragon god," "singing dragon," and "dragon song." The menu is provided in English, and our server was European and spoke English fluently. I assume that, like many other places, an effort is made to match tables with compatible servers. Some suggest that the restaurant may be trying too hard to appeal to an international crowd. To me it seemed just an extension of the hospitality that is so ingrained in Japanese culture. The abundance of soup-y dishes in a multi-course menu – four here, all told – initially struck me as somewhat peculiar. But as we saw the pattern repeated, I quickly grew accustomed to it, particularly when the soups are so simultaneously flavorful and light like this dashi. After our first fugu experience a couple days earlier, Mrs. F insisted I have hers as well. I'm not sure how to feel about that. I did quickly learn to appreciate the pattern of closing meals with rice, soup and pickles. I have no idea if it's by design, but the rice ensures that no matter how delicate and dainty the courses that preceded, you'll never leave hungry (and indeed, almost all places would offer an extra serving or an additional rice course if you still had the appetite); the pickles tend to perk up the palate; and the light soups seem to have a beneficial effect on digestion.